We recently acquired a brand new Wacom Cintiq (pronounced WAH-kum sin-TEEK) tablet. The tablet acts as a monitor, but also allows you to draw directly on them with a pen-like stylus, reacting to pressure in the same way a paintbrush or marker might so that you can sketch, draw, paint, and composite with natural and intuitive precision. 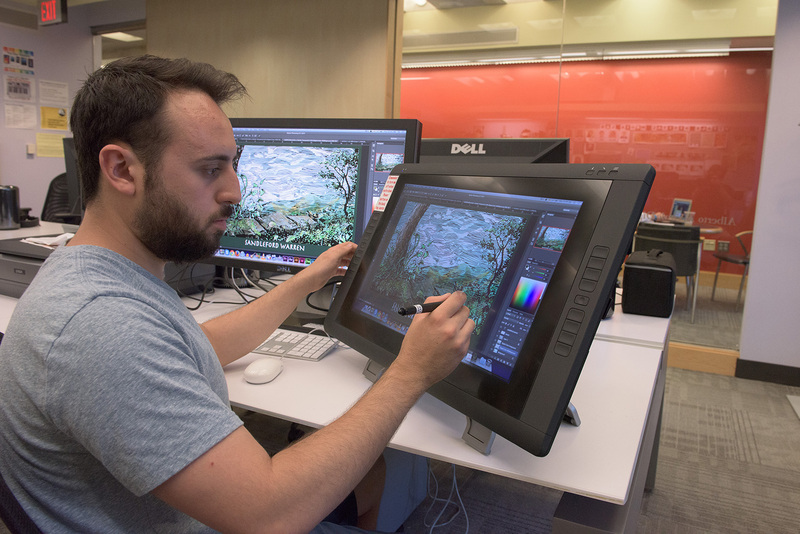 Here, Pat Gabrielli (Penn BFA 2015) is digitally inking and coloring some artwork that was drawn and painted by Penn faculty member and Ulysses Seen artist Rob Berry. The final images will serve as sets for an upcoming stage production of Watership Down, to be performed by the Simpatico Theatre Project at the Mandell Theater on Drexel’s campus in November. Please stop by the lab and ask to try out the new Cintiq tablet!